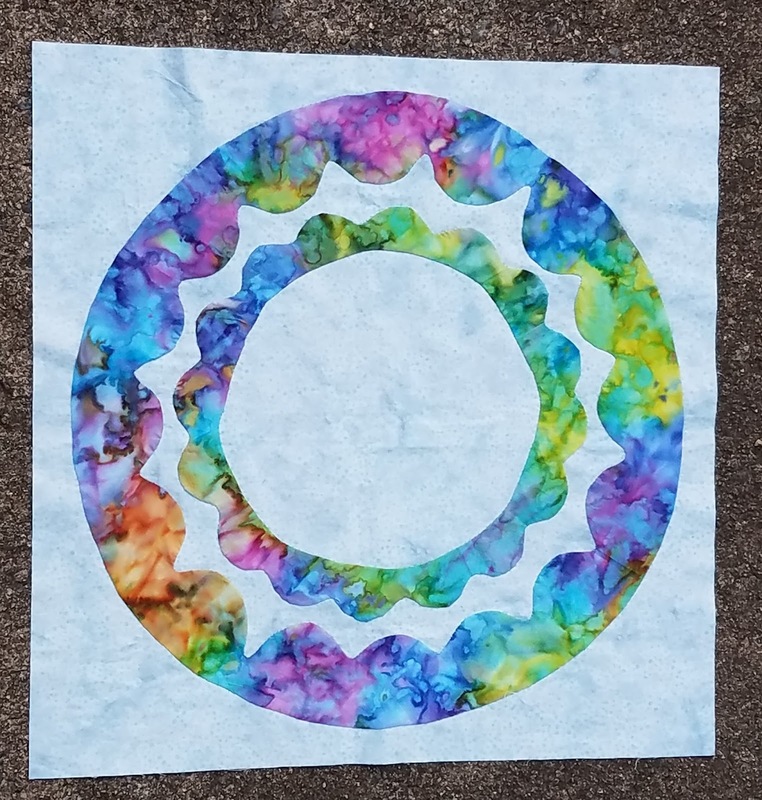 In January 2013, I was reading class descriptions from my local quilt shop when I came across one that said, "Scared of curves? This is the class for you!" Well, I was scared of curves and I had seen the class sample, so I figured it was a good chance to conquer my fear. 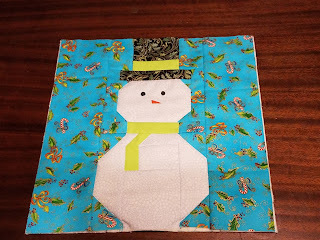 I bought the pattern and the specialty ruler it required and did all the pre-work (cutting) for the class. When I got home that night, I put the bin with the project under the guest bed and didn't touch it again for years. Literally years. I was pregnant when I took the class and I had other sewing that I cared more about getting done before the baby came. And I still didn't like sewing curves. Well, it is now long past time to finish this. I had no desire to make any more blocks, so I laid out what I had in as pleasing an arrangement as I could. 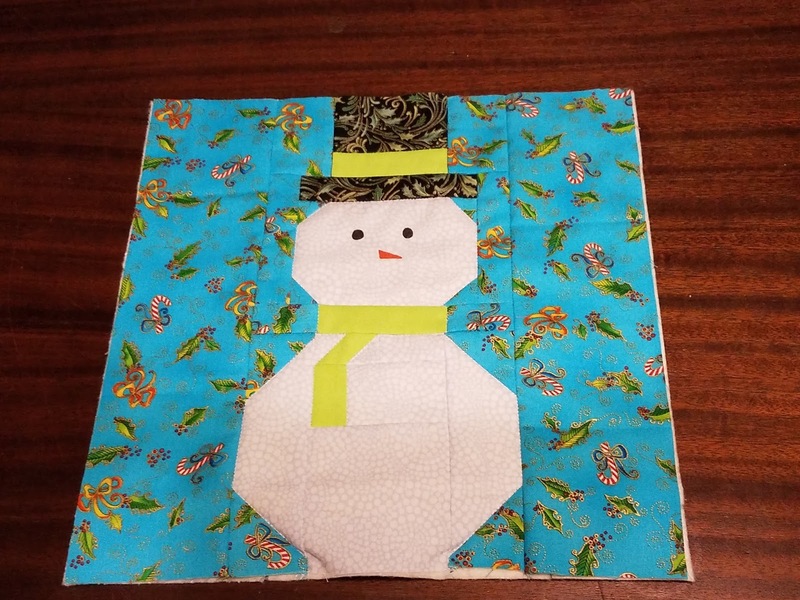 I added a border to make it a slightly better size for Project Linus and I'm calling it done. 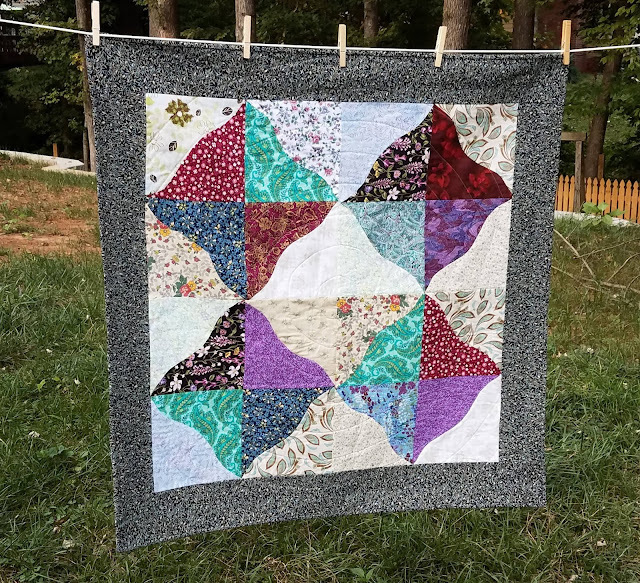 I do not consider my fear of curves conquered, but at least this is finished and I don't have to think about it under the bed taunting me any more. I am not sorry to see the last of this project! Funny side note: I haven't looked at the actual pattern in a while, so I've been calling it Savannah because I live half a day's drive from Savannah, Georgia. But the pattern is actually called "Savanna," presumably after the animal prints used in the pattern's cover version. This was #2 on my list of Q3 goals for the Finish Along. A few years ago, I bought the panel for Coral, Queen of the Sea by Stacy Iest Hsu. The panel included a Coral Doll, doll-sized quilt, doll-sized pillow, Mr. 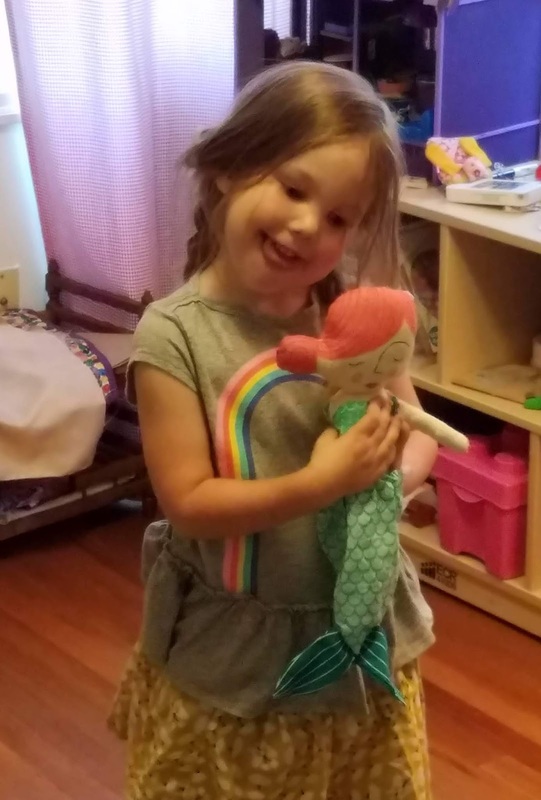 Bubbles the seahorse friend, a doll skirt and a doll mermaid tail. I stored the panel away hoping that a child in my life would go through a mermaid phase. That's a lot of projects in one panel! Fast-forward to early June when I was texting with my sister-in-law about my niece's current preferences. She's super into mermaids! Great timing, because we already had a July trip to visit her planned. I dug out the panel and was thrilled to find that it was as cute as I remembered. Noodle loves Coral and had a great time putting her to bed. I typically don't make 3-demensional projects. This one was too cute not to buy, and I'm really happy with the end product, but I didn't enjoy some parts of the process. The blanket was easy. (I even quilted it for real instead of using the turn-it-inside-out-and-tie-it method in the directions.) The pillow and Mr. Bubbles the seahorse friend were easy. 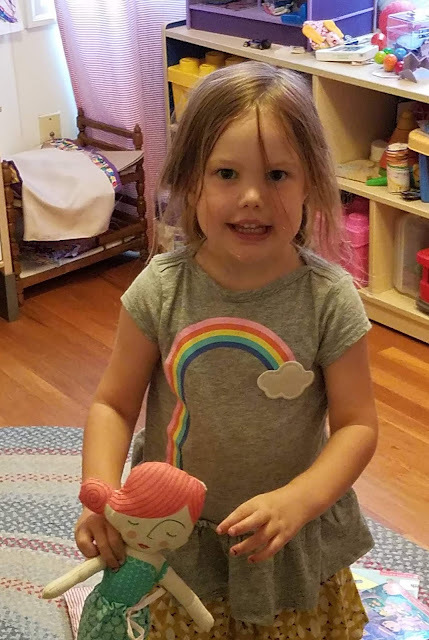 The doll was a little tricky, especially turning her limbs right-side out. And the skirt and mermaid fin, well, I'm not sure I did those correctly. I totally cheated and used ribbon instead of the printed ties for the closures. 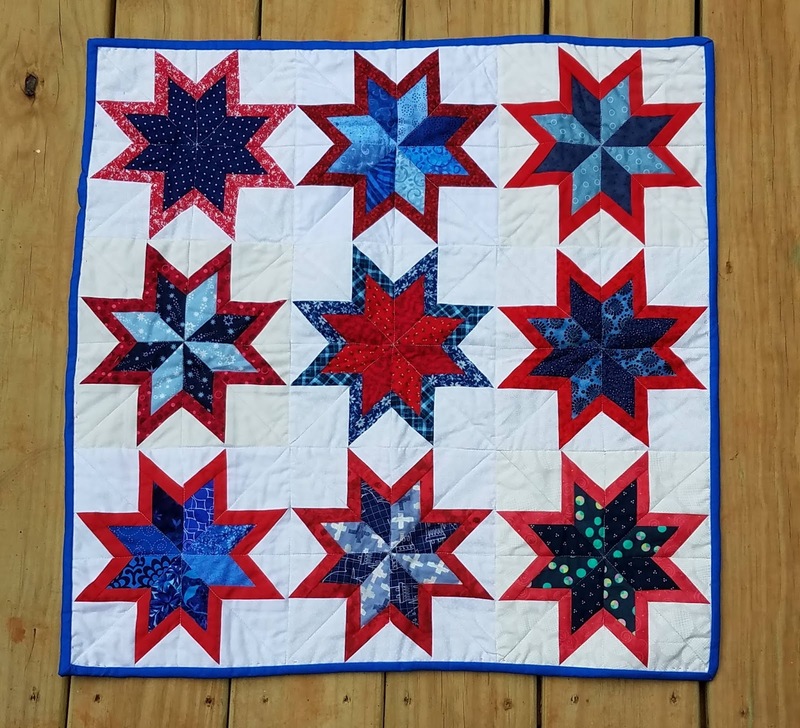 Overall, while this is not my favorite kind of project, how can I be sorry about the extra fussy parts when this is the end result? This was #7 on my list of Q3 goals for the Finish Along. I can't believe half the year is over! We're now into the third quarter of the Finish Along. I really love the Finish Along community and motivation. Here are my projects for this quarter. As always, I'm listing way more projects than I will actually complete because I never know what I will be in the mood to work on. I took this class in 2013 and hated the curves, so it sat untouched for 5 1/2 years. It's finally a top and just needs to be completed. I'm ready to put this one behind me! My coworker April is expecting a baby girl in August. I have the top completed. 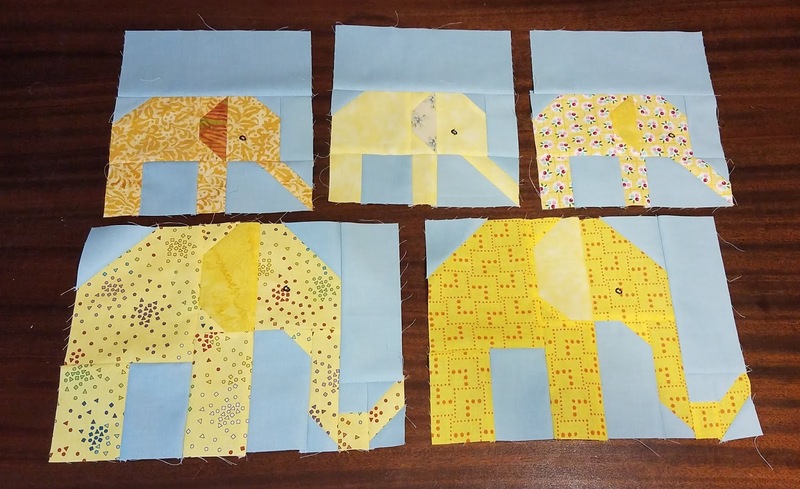 Last year, I made elephant blocks for the Rainbow Scrap Challenge. I took the pink elephants out for their own quilt, so this is a more traditional rainbow. 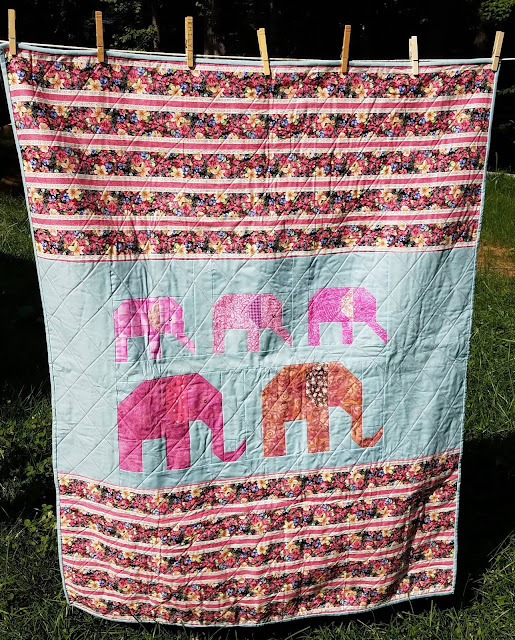 Two of my closest friends from college are expecting their second child in September and I really want to give them a rainbow made of elephants. My good friend Devin, also a college buddy, is expecting his second child soon. 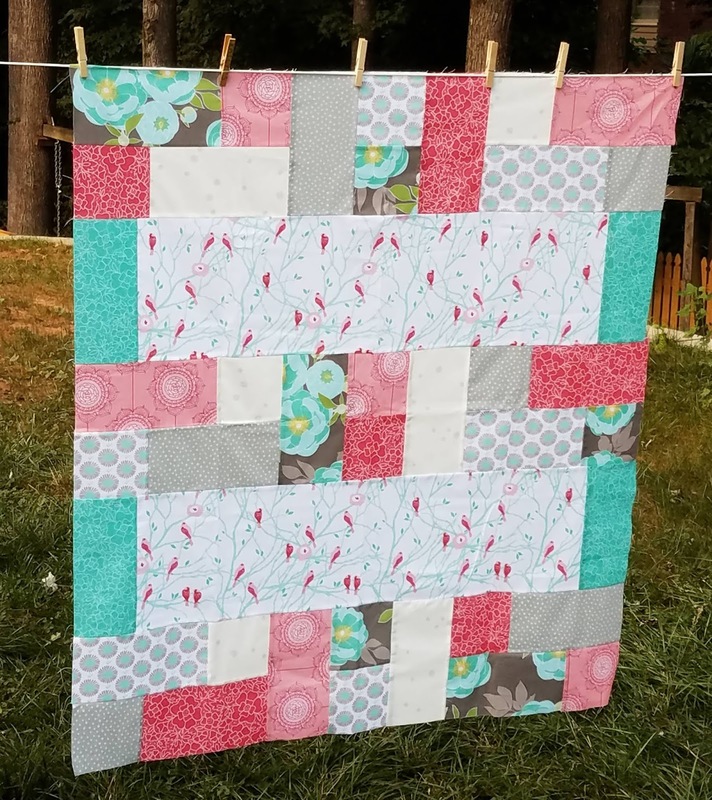 I plan to make an I-Spy quilt to match older sister's. 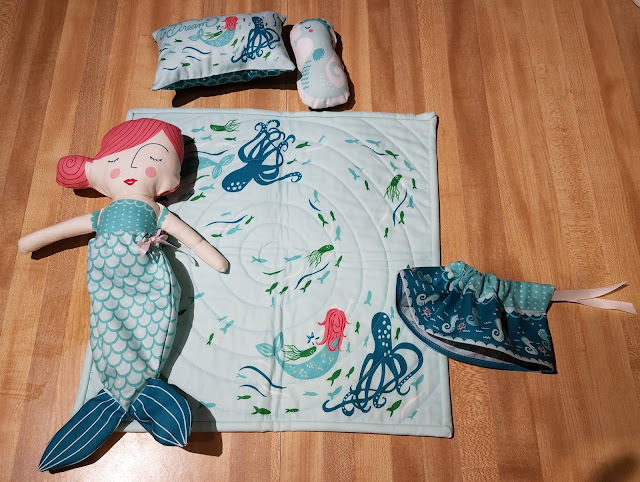 I bought a panel to make the doll and accessories a few summers ago and now my niece is way into mermaids, so I finally have a reason to sew them up! I've got the pillow and Mr. Bubbles done, just need to finish the rest. 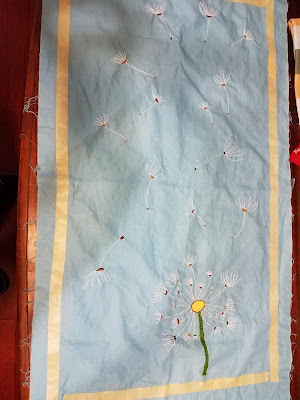 Another hand sewing project. I have the applique completed but I'm not sure how to bind it. I'm thinking a faced binding, but I'm not sure how to do that, especially with felt. 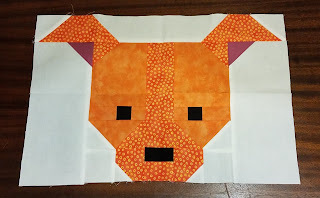 This one got stalled out due to running out of fabric. I have what I need now, but I just realized I forgot to take a picture; it's called Canyon because it features Kate Spain's Canyon line. 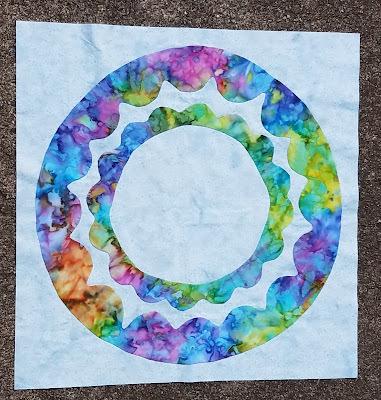 A UFO I forgot about, this is a top that needs to be turned into a finished quilt. When my son wants to sew with me, I pull out a bag of sports-themed I Spy squares and we chain piece until he gets bored. It's in rows now, ready to be assembled. These were my bee blocks from April. 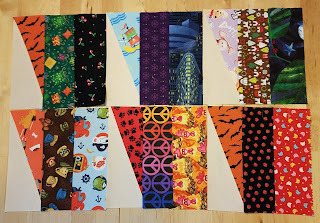 Most of them were turned into a door decoration, but I still have a few blocks left to turn into a donation quilt. 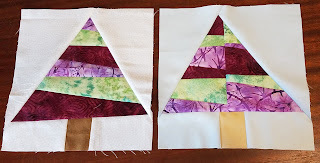 It's been a few months since I linked up to One Monthly Goal hosted by Patty of Elm Street Quilts. I like the motivation, so I'm back for July! I have a long-term UFO that I'd like to finally get done. Several years ago, I took a class for a pattern called Savanna that was popular in my area. 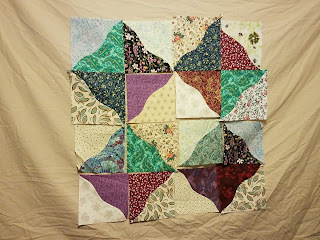 It featured curved piecing, something I was intimidated by. I took the class but didn't touch the project after that. The class was in January 2013. 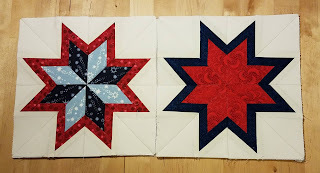 Knowing I had no desire to continue the curved piecing, I dug out the blocks that were already completed and tried to turn them into a design that made sense. Getting this completed to donate to Project Linus is my goal for July. I know, we're almost a full week into July. But I never recapped May, so I planned to do May & June at the same time. And at this point, what's one more week late? 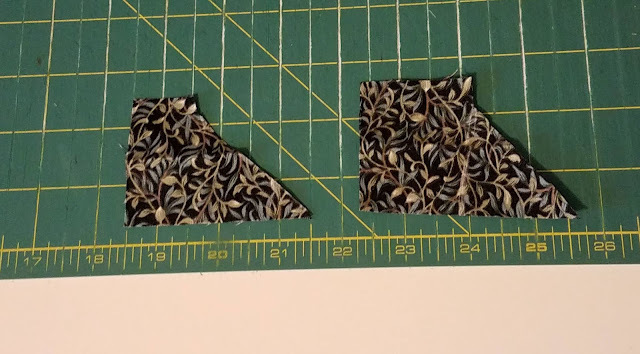 Inspired by Kate at Life in Pieces, I've been tracking days that I spent at least 15 minutes sewing. 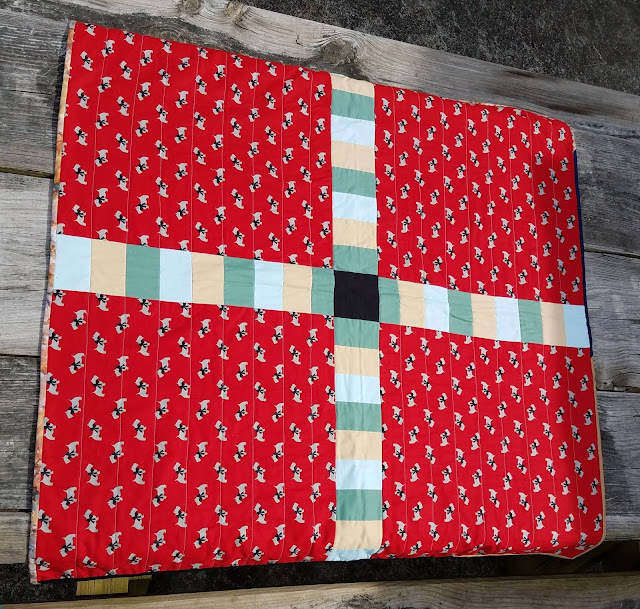 In May, I got sewing time 28 out of 31 days for 90 %. 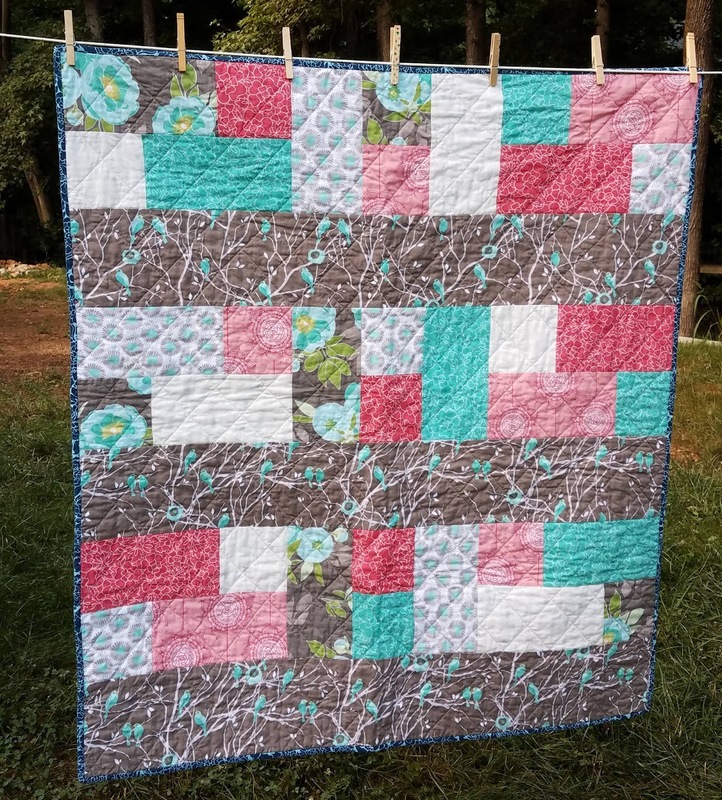 In June, I got sewing time 24 out of 30 days for 80%. My year-to-date total is 147 days (out of 181) for a total of 81%. I'm also tracking yardage used (calculated when a project is finished) and yardage bought. In May, I used 4 yards. In June, I used 5.3 yards. My year-to-date yardage used is 40.9 yards. I did, however, make fabric purchases in both May and June. 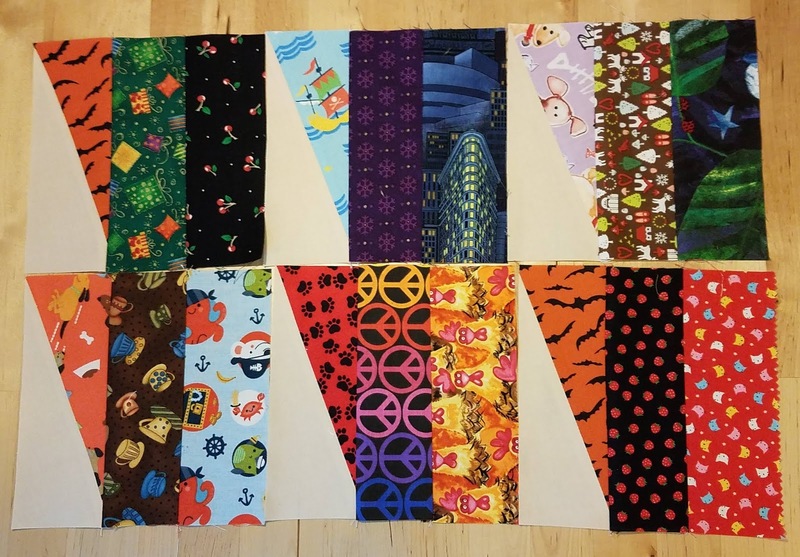 In May, I bought 6.75 yards and in June I bought 8.8 yards. 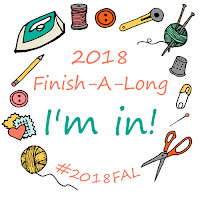 My yardage bought for the year is 28.3 That's more than I intended, though almost all of that is for specific, intended projects that will likely be finished by the end of the year. 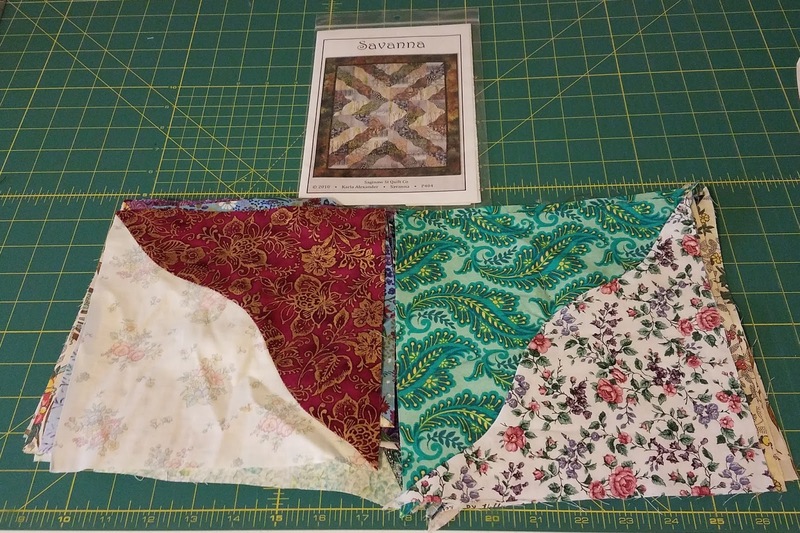 Some of the June fabric purchases were specifically for the Eye-Spy Swap hosted by Val. I finished two projects each for May and June. 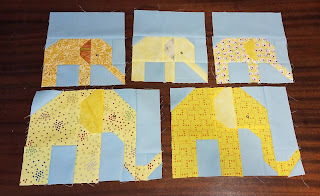 May's projects were Scottie Dogs and Elephants in the Garden, both donation quilts for Project Linus. In June, my finishes were a baby quilt for my friend Amy's daughter and a patriotic door quilt for me made of bee blocks from Bee Inspired.